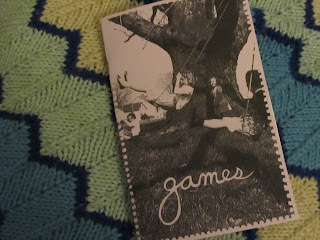 I am currently gearing up to leave for two zine fests very soon: first in Rochester, then in Chicago! But the crunch-time-horror-show that has been me preparing for all that fun has been a REAL bummer. I have been at warp speed all week, working at the bookstore every day, traveling to and working horrid hours at conferences, and finishing up a new zine in all of my free moments. But my mania has paid off! So handsomely! It is finished, right on schedule. This one's all about games! Games are so g-d important to me and my friends, so I figured it was about time I get serious about documenting all the ones we play and have made up and inherited and just generally coddled over the years, in hopes that they can reach others. Get their little webs all over people. Take firm hold and never let go, you know? A real, wholesome, violent wave of fun. That's what I'm envisioning with this thing. Perhaps it's ambitious? It includes instructions to 24 games, assorted examples, drawings by so many pals, stories here and there, a handy index, and a beautiful cover designed by Simon Thrasher. It basically equates to a lifetime of fun, whether you're in a car and need a game to play, have a whole night ahead of you, are looking to play a game at the campfire, want to find a way you can recreationally lie to your friends and have it be sort of acceptable (i'm talking about Village, of course), or if you're just hoping it will provide some answers as to why you always see me and my friends with dumb stuff written on our knuckles. 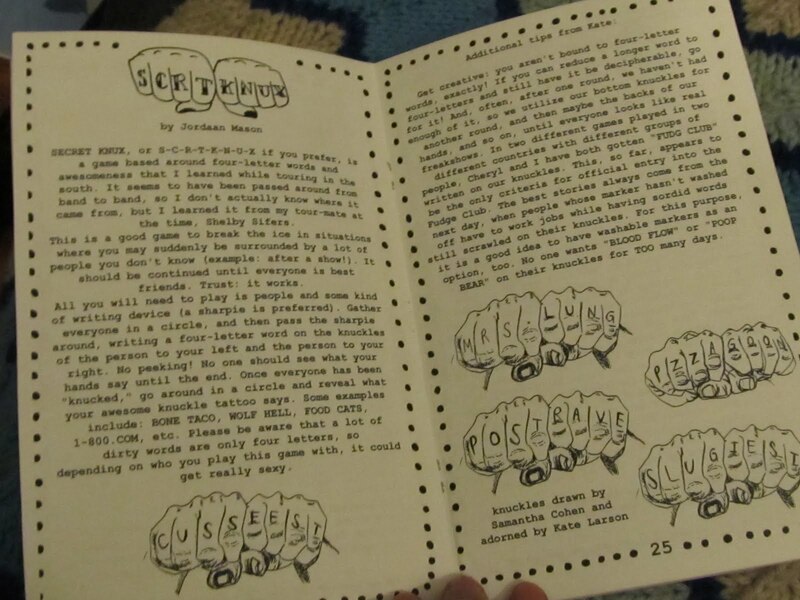 This is the zine for you! It's 48 pages long. Cardstock cover. It'll run you $3. I'm bringing em along with me to the zine fests, let's see how people like them. I'll start distributing locally and shipping them out once I get back in April and can R-E-L-A-X. I'm spelling that word out so it feels more real. So, it follows that I've been doing much printing/collating/folding/stapling. 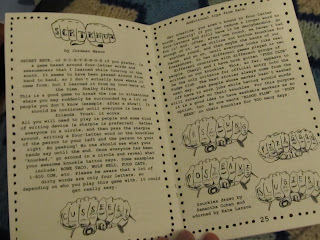 All that business gets rather tedious once you start making your zines in pretty large runs. This is what my floor has been looking like. Disaster zone. So much paper. I think I'm even developing a stapler callus. I've been joking about getting an intern, so I don't have to do it all myself anymore. Any applicants for the position (also known as: friend who wants to hang out in rooms with me while we both fold paper) can shoot me a message. Resume: optional. You just have to have thumbs, I guess. I'm not picky. Soon I'll start working on forging college credit forms, so I'll have that to offer. And if that does you no good, I will pay you in long wistful stares. Intermittent sighs, the whole package. I await your queries. I am also in the time-crunch of making a banner for my table at the fests. I bought way more fabric than I'll ever need and cut out cursive words to be sewn onto it. Hand-stitching heroine Samantha Cohen sewed me some apples for it, too! It's a work in progress, here's to hoping it'll be ready by Sunday. POOP BEAR still haunts these knucks.